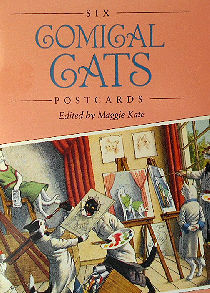 This little Dover booklet contains the reproduction of six comical cat postcards. The postcards are reproductions of antique postcards of cats as children at school, shopping, in the kitchen and at the dentist office etc. The post cards are 4 1/8" wide x 5 3/4" high. Booklet is previously owned but unused.